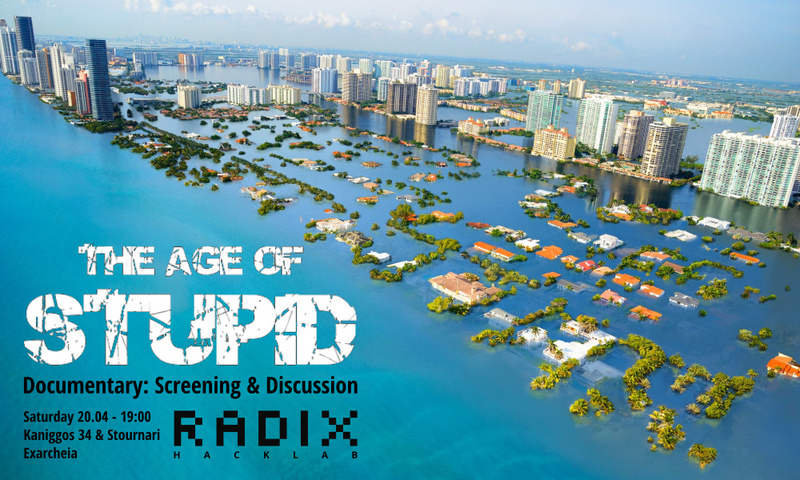 “The Age of Stupid” (2009) documentary screening. 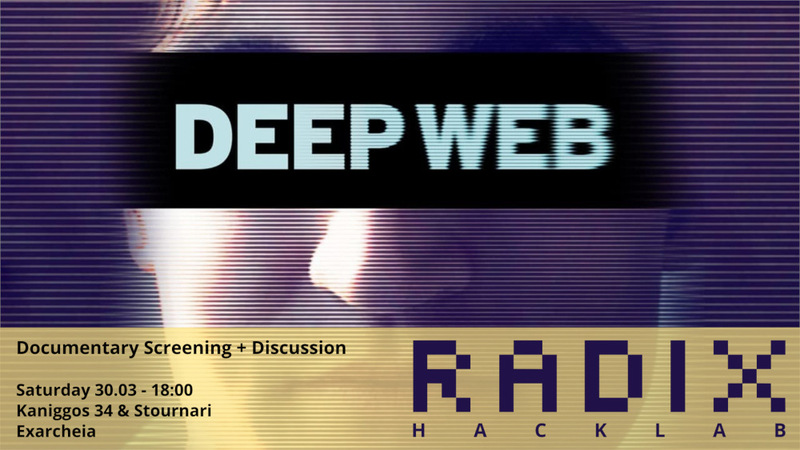 “Deep Web” (2015) documentary screening. Roll on disco anthems & non-binary vibes! 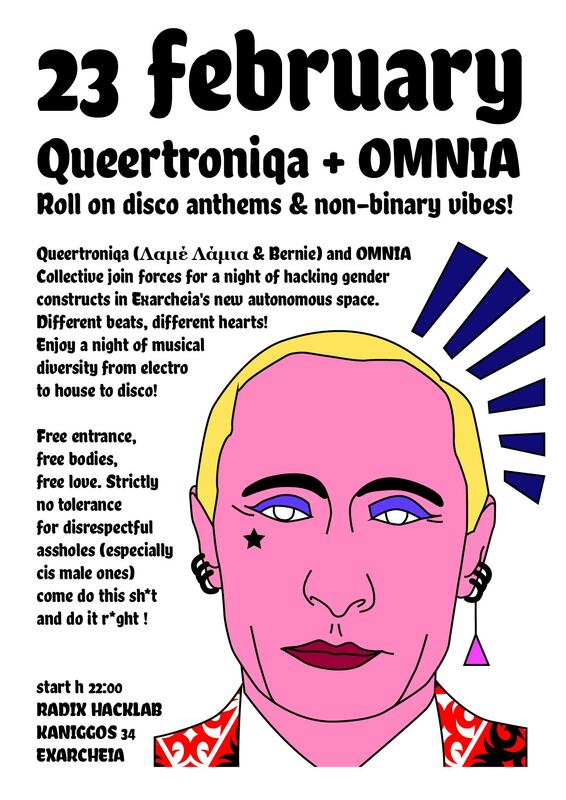 Queertroniqa (Λαμέ Λάμια & Bernie) and OMNIA Collective join forces for a night of hacking gender constructs in Exarcheia’s new autonomous space. Different beats, different hearts! Enjoy a night of musical diversity from electro to house to disco! Free entrance, free bodies, free love. COME DO THIS SH*T AND DO IT R*GHT ! Retroshare, Cjdns, Scuttlebutt, Yggdrasil, Ipfs, distributed content networks, Libremesh, qmp... and more! 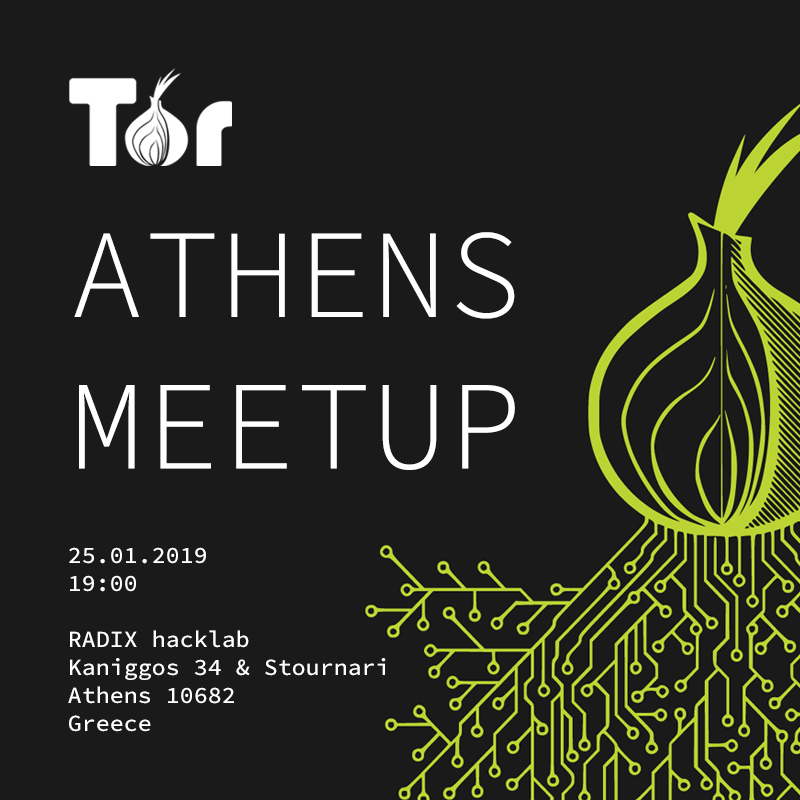 The first Athens Tor Meetup for 2019 will be held at the 1st Floor of Radix Hacklab, Kaniggos 34 & Stournari, Athens, Greece on 25.01.2019 19:00. Tor is free software for enabling anonymous communication. The name is derived from an acronym for the original software project name “The Onion Router”. Tor directs Internet traffic through a free, worldwide, volunteer overlay network consisting of more than seven thousand relays to conceal a user’s location and usage from anyone conducting network surveillance or traffic analysis. Using Tor makes it more difficult to trace Internet activity to the user: this includes “visits to Web sites, online posts, instant messages, and other communication forms”. Tor’s intended use is to protect the personal privacy of its users, as well as their freedom and ability to conduct confidential communication by keeping their Internet activities from being monitored. Come learn about how Tor can help protect your privacy and security online. Depending on the group’s interests and familiarity, we will be prepared to discuss Tor Browser, the Tor network, running relays, and onion services. The first Radix Hacklab Open Assembly will be held at the 2nd Floor of New Babylon Squat, Tzavella 25, Athens, Greece on 11.12.2018 19:00. The Radix Hacklab is a not-for-profit autonomous collective, part of a global movement of hackers and makers setting up a radical, community-run, physical space for people to come together to learn, share, organise, and create. At Radix, we make decisions with the informed consent of participants, who all share responsibility for running the space and keeping it safe so we can be dangerous together! For this purpose, we will agree on as few rules and boundaries as possible, but as many as become necessary. We support diversity & inclusion, feminism, solidarity, and respect. We are against dominance, hierarchy, exploitation and profit. We do not tolerate intolerance. Radix will open as a no-smoking space and is not meant to be used as a personal or commercial office. We are supporters of libre / open source culture, peer production, cooperation, copyleft, DIY & do-it-together and free access, with diverse interests including (but not limited to) software & hardware hacking, repair & upcycling, free public networks, security, graphics/audio/video production, commons infrastructure, open publishing & bookbinding, artificial intelligence, and art. Radix can only exist thanks to participants committing to contribute to meaningful discussion, skill and knowledge sharing, common projects, and access to the necessary tools and resources. As an early stage project, Radix’s identity will be determined by its participants – everyone who shares compatible values is welcome and invited to participate and join us in producing a radical shift in the way our society works.